Abu Dhabi: Falling oil prices are expected to impact the aviation sector, bringing down airfare, but passengers can only expect to see the lower prices a few months into the new year, according to analysts. Since most airlines purchase their jet fuel months in advance, the drop in oil prices is expected to echo in aviation sector around the second quarter of 2015, provided oil prices do not bounce back. “My experience in the UK with petrol prices tells me that a reduction in pump prices comes always well after falls in wholesale prices, and usually only when pressure has been applied by governments in response to public anger. I don’t see why it should be any different with the air transport industry,” said David Bentley, Principal at UK-based Big Pond Aviation. In an emailed statement to Gulf News, Bentley said he expected many airlines to be locked into price hedging deals, making them pay higher prices than the current oil rates. As passengers anticipate falling airfare, airlines may see other effects of tumbling oil prices, which have halved in a matter of weeks. “The other main potential impact for me is that the fuel price reduction prompts the airlines into ordering more aircraft to meet what turns out to be only a short — rather than long-term — spike in demand, creating another overcapacity issue several years down the line,” Bentley said. Another potential downside could be if governments saw oil prices as an opportunity to raise the already-high taxes on air transport. As for airlines, some responded to oil prices saying that the prices will factor out longer flight paths. Emirates Airlines told Gulf News it has recently avoided flying over Iraq, Syria and Ukraine due to safety issues, though the longer paths lead to increased fuel consumption. “Fuel prices remain volatile, and jet fuel is still a significant cost component for most airlines. Emirates has already incurred significant costs by absorbing the previous price increases, and the fuel surcharge gives us the ability to respond faster to market conditions, rather than a lengthier process of incorporating them into fares,” the airline said in a statement. UK-based aviation analyst, John Strickland, Director of JLS Consulting, agreed, saying that airlines tend to be hedged on fuel months in advance. “…Equally, [airlines] have had to absorb high prices in recent years which they have been struggling to recoup. Market competition is a stronger driver of competitive fare levels, and Gulf carriers are proving successful in attracting customers as can be seen from the high load factors which they achieve on their services,” he told Gulf News via email. Looking past oil prices, the aviation sector is expected to grow in 2015 as major carriers continue to purchase new aircraft and expand their routes. In the UAE, the sector will be buoyed by the growing tourism industry where there are plans to attract an increasing number of visitors to the country. Dubai-based budget carrier, flydubai, said it will continue to support the government’s 2020 vision of attracting 20 million tourists to Dubai through adding more routes, frequencies and aircraft. “Aviation in the UAE continues to play an important role, and is poised to contribute 37.5 per cent to Dubai’s GDP [gross domestic product] by 2020, as Dubai International Airport continues to cement its role as the world’s busiest airport by passenger numbers,” flydubai said in a statement. 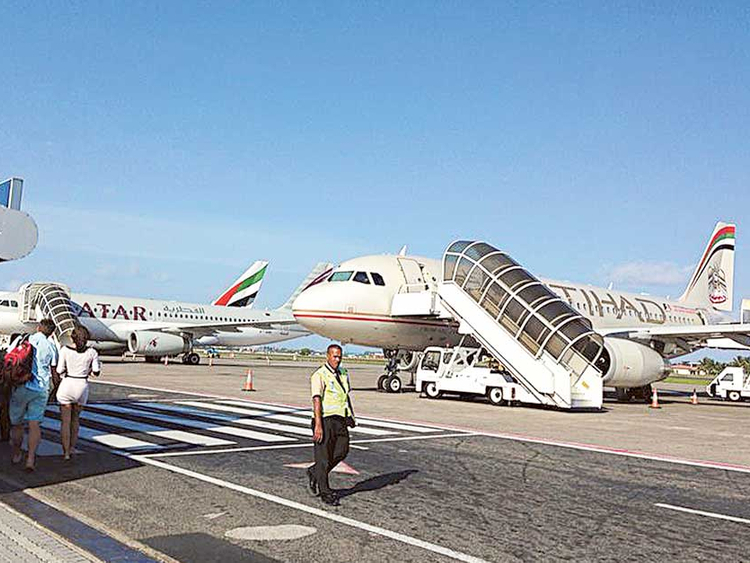 It also noted that it launched 23 new routes in 2014, along with the creation of a network of 89 destinations across the GCC, Europe, Africa, and the Indian subcontinent. Similarly, Abu Dhabi-based Etihad Airways, said it is growing its network and services, and expected increased revenue, but did not specify numbers. The airline, whose passenger numbers grew nearly 19 per cent in 2014, said it expected continued growth. “There will be challenges ahead but with our strategy of minority equity stakes, organic growth, and codeshares, we have set a path for the long term and are confident of building on that success in the year ahead,” an Etihad spokesperson said. The spokesperson added that growth will get a boost from the addition of Airbus A380 and Boeing 787 Dreamliner to the airline’s existing fleet. Big Pond Aviation’s Bentley supported statements on growth in the industry saying that it has been having “one of its best spells for many years,” and that the sector should see record profits next year. “Some segments, such as regional air services, will continue to find the going hard, especially where they are ranged against high-speed rail. I foresee no immediate issues to counter the continuing influence of the Gulf, and the UAE in particular, in 2015 with one exception, namely that there is a serious question mark about the future of the A380,” an analyst said. Discussing challenges on a global scale, the analyst added that the industry is “one incident away from a ‘car crash’” and that the hit could come from anywhere like North Korea, Russia and the Middle East.